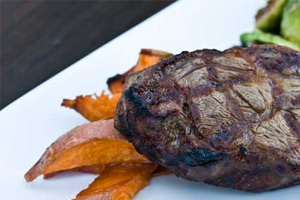 Llama meat is a leaner, healthier alternative to beef. 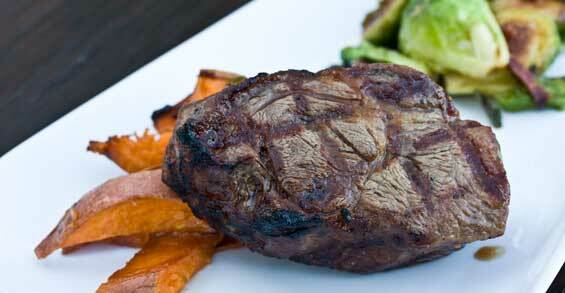 Its complex flavor is difficult to describe, but lies somewhere between beef and lamb. Llama ribeye steaks are similar enough to beef steaks that we recommend cooking them using the methods in our Three Techniques for Cooking Steaks blog post. Just remember that they tend to be leaner than beef and thus can cook more quickly than you expect. Here we’ve paired them here with roasted yams and bacon sauteed brussels sprouts. 2. Rough chop the yams or potatoes into equivalent sized pieces. 3. Place in a single layer in a baking dish and cover lightly with salt, pepper and oil. Put in the hot oven to roast. 4. Pull yam half way through cooking to turn pieces. 5. When finished remove from the oven and garnish with leaves of fresh rosemary. 1. Clean the brussels sprouts. Remove a few of the outer leaves and a small amount of the woody stem from each sprout. If they are especially large, halve to match mass with the smaller sprouts. 2. Slice the bacon into batonnets (small sticks) and render out the fat in a large pan over medium heat. 3. Remove the bacon from the pan once it has become crispy and reserve for a garnish, leaving the bacon fat in the pan. Sauté the sprouts in the rendered fat, 2tbs of butter and a pinch of salt. Turn them as they caramelize to brown evenly on all sides. When they are finished remove them from the heat and sprinkle in bacon bits prior to plating.